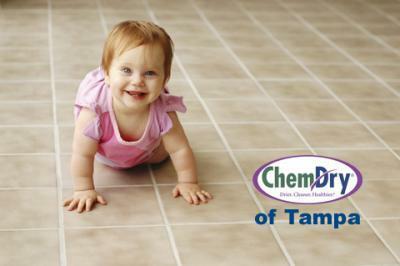 We clean a lot of Tile in Tampa FL and we often get asked questions. Primarily, about sealing tile and grout and why it should be done. First, let’s clarify a point about tile installation. Most home builders and tile layers do not seal grout during an installation. A lot of the time it is because the grout needs to cure before it can be sealed and curing takes about 24hrs. And, tile installer are not scheduled to come back and seal the grout. So most homes have tile surfaces that have never been sealed. Now, why should you seal tile and grout? The main reason is because it will keep it clean and prolong the life of your tile floor. Most tile, ceramic and porcelain are not porous and don’t need to be sealed. However, natural stones such as: granite, slate, and limestone are porous and do need to be sealed. Grout too should always be sealed. This is because most grouting material is made up of sand which is very porous. (The exception is epoxy grout which never need sealing.) Grout gets dirty from regular foot traffic and daily use but cleaning your tile floor can add as much dirt as it cleans. Dirty mop water or cleaning solutions get funneled through your grout and leave a lot of dirt as it dries. We’re not saying you should not clean your tile, just make sure you’re change out your mop water, or solution, often. There are several benefits of sealing your tile and grout. It will resist re-soiling and be easier to clean. It will also prolong the life of your grout by protecting it from flaking or eroding. Sealants also strengthen your grout so it doesn’t chip as easily. Thankfully there is a way to clean and seal your tile surfaces in one easy step. Check out this video to see how easy it can be.